The interior design of your home could show a stranger exactly what type of person you are at a mere glance. Since you probably prepare meals in your kitchen at least twice per day, it experiences more wear and tear than anywhere else, which does nothing but highlight your personality. In the same way, your living room reveals how you simmer down after a long day, in your own particular way. Most people opt for soft or neutral colours in the kitchen. Light green, turquoise and blue create a calming environment that highlights a tranquil disposition. Bold colours such as dark blue and red can have adverse effects and often represent a more energetic persona. Colours can significantly affect your mood, so if you’re thinking about decorating, use them to make a statement. Perhaps a few bold accents could give you the energy to put in a little more artistic effort in the future. Your refrigerator isn’t just an appliance that’ll keep your food and beverages cold. As the most used tool in your kitchen it gives more away about your personality than any other piece of hardware. According to Landlord Station, a classic white refrigerator shows that you are a family oriented person, while a stainless steel refrigerator is a sign of passion and knowledge. Bold coloured refrigerators are often used to show off certain styles, for example, red and turquoise is synonymous with the retro look. Your kitchen and living room contain more of your belongings than any other room in your home, and are without a doubt the easiest rooms to get dirty. Letting dishes stack up is a sure-fire sign of laziness, so if you don’t want others to judge you, give them a clean before you let anyone inside. In addition the arrangement of your appliances can have a significant bearing on people’s opinions. For example, placing chopping boards and knifes near you cooker shows that you’re practical and organized; however, if they’re housed in a cupboard or as an ornamental design, it shows that you care for appearances more than functionality. Your furniture arrangement in your living room can also say a lot about you, from where you position your tables and chairs in a particular room, to the condition they’re in. Strictly Tables and Chairs have a range of furniture for browsing online, at a range of prices depending on quantity. If you have a lot of herbs and spices, then no doubt you enjoy cooking from scratch; ready meals on the other hand, show that you don’t have much free time and probably lead a very fast paced lifestyle. What you eat and drink says a great deal about your personal health. A full fruit bowl or water filter can show that you take your well-being seriously. There’s no better place in your home for expressing your true personality. Now that you know what your kitchen says about you, check out the spaces on Nicolas Anthony and see if there is a design that suits both your style and character. 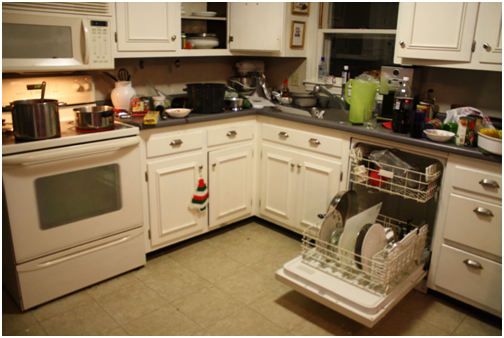 Image Caption: A messy kitchen could mean you’re a disorganized person.